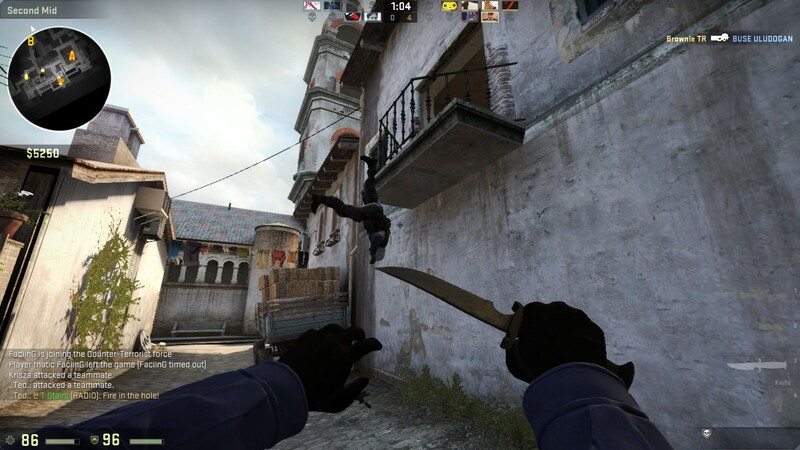 It is easy to get wrapped up in Counter-Strike: Global Offensive. Predominantly because of the short rounds and competition that comes along with its FPS multiplayer atmosphere, the addicting fun can last for hundreds of hours. To some players, that fun is also worth hundreds of dollars. 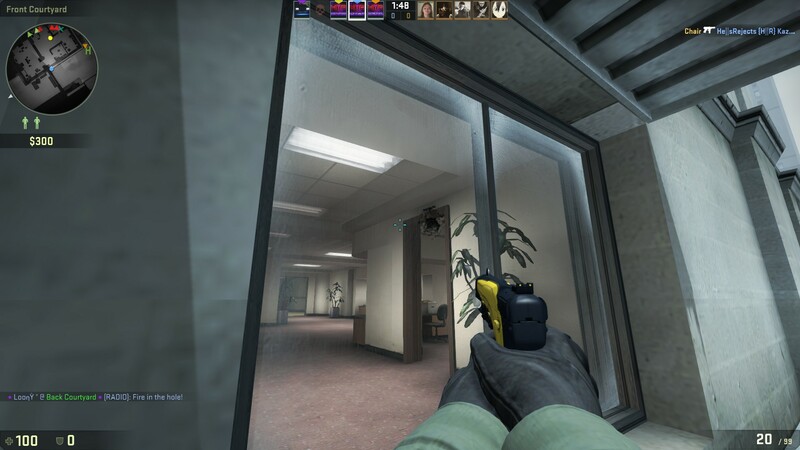 Cosmetic items, or weapon skins, have been popular since they were added post-release, enhancing CS:GO with an extra feature and level of entertainment. Not only do they make weapons appear more attractive, but also being on the quest to unlock them is a rewarding game in and of itself. There are many eye-catching weapon skins to choose from – if you are willing to pay, of course! Here are ten of the absolute best. As both the spawn pistol for terrorists and the cheapest gun available for purchase in game, the Glock-18 is something you see a lot of in CS:GO, especially in pistol rounds. It is semi-automatic, firing in three-round bursts. However, as an inexpensive and basic choice, there are plenty of players who steer clear of the Glock-18. Overall, its armor penetration is poor, and its accuracy is only middling. A player wearing Kevlar armor and wielding another, more potent weapon could effortlessly overpower someone who only has a Glock-18. Want a way to improve your Glock-18? Purchase the Fade skin for it! Although there is no cure for imprecision or lesser firepower, at least you will be able to shoot in style. The Fade skin features shades of yellow, orange, pink, and indigo paired against an opaque black handle. Rarely will another weapon be able to rival this rainbow. A factory new Glock-18 | Fade’s median price on the Steam Marketplace is currently at approximately $217, but it has been sold for as low as $1.01 in the past. Death By Kitty is a unique design you will notice from miles away! A powerful submarine gun, the P90 is sure to grab the attention of whomever you are playing against. Its high rate of fire and large fifty round magazine size makes the holder a true force to be reckoned with, but be careful, because it takes quite a while to reload. The Death By Kitty skin will only increase your notoriety! It features bold animal skulls in practically every neon color known to man, as if taunting the target of their bullets. On the Steam Marketplace, a Death By Kitty skin with minimal wear will cost about $150 for your P90. While not the most rare of guns, the SG 553 Pulse is still is a delight to look at. 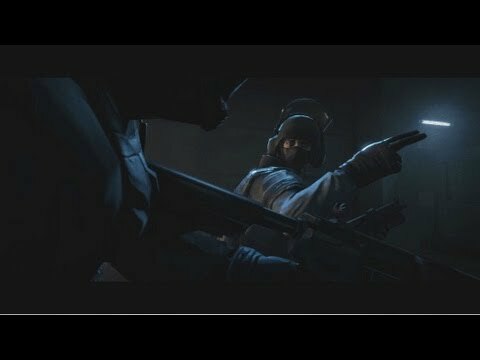 The SG 553 is another terrorist-only use weapon. Because it has a high firing rate along with a scope, it is extremely versatile. Players also like the SG 553 for its 100% armor penetration rate and ability to kill in one shot. Pulse, too, is popular – probably one of the most common weapon skins in CS:GO. The striking shades of lilac and pink fuse into fuchsia, surrounded by a border of dark purple and black. It truly has some attitude! This particular gun, a minimally worn SG 553 | Pulse, costs a mere $1.10 on the Steam Marketplace. You can sure light somebody up with this gun. The UMP-45 is a submarine gun that is, otherwise, the opposite of a P90. It is fairly slow, the magazine size is little, and can be used accurately on long distances. Moreover, it does not have quite the popular reputation as the P90, making it a much more special weapon. It pairs nicely with a Blaze skin, because the traditional fire design juxtaposes the atypical use of the UMP-45 itself. If a player wants to look really cool, this set is right for them. A minimally worn UMP-45 | Blaze current runs at about $41.00 on the Steam Marketplace. The AWP is ready to strike. Well-admired among snipers, the AWP is the best weapon for what it does, which is stop whoever it hits in their tracks. Almost every shot is a one-hit kill, save for a blow to the legs. Besides that, as with other guns in its class, the AWP can deeply penetrate armor and works best for attacks from a long range. Perhaps its only flaw is the expensive price tag, but that does not sway its loyal fans. The Lightning Strike skin is just that – striking! A milky grey jolt of lightning extends across a dark purple background, giving off the appearance of a stormy night sky. Right now, AWP | Lightning Strike guns trend at about $41.00 on the Steam Marketplace. The Galil AR, sometimes known as the Galil ACE 22, assault rifle is yet another terrorist-exclusive weapon that can be awesome. Its magazine size is exceptional for that type of gun, and it has a high rate of fire that executes relatively strong penetration at 75%. Both its price ($2,000) and its kill reward ($300 Competitive/$150 Casual) are simply average. Rocket Pop can bring on some nostalgia for those of us who are familiar with the Popsicle of the same name! This skin seems to replicate the appearance of the classic Red, White, and Blue Turbo Rocket Popsicle, which has corresponding flavors of cherry, lemon, and blue raspberry. It could also be great for an American who feels very, very patriotic! The Galil AR | Rocket Pop is very affordable at approximately $1.20. The Desert Eagle is somewhat of a deluxe pistol; it is the most expensive and prides itself on its high damage, penetration, and accuracy. For instance, a headshot with a Desert Eagle pistol will be an instant kill in all cases, regardless of whether the opponent is wearing a helmet or not. Unfortunately, it is semi-automatic, and neither the rate of fire nor reloading times are very rapid. That only increases the importance of achieving high accuracy. When a high-skilled player is holding a Desert Eagle, others better beware! A fun and groovy skin, the Hypnotic is sure to inspire electrifying play out of its wielder! Far out. A factory new Desert Eagle | Hypnotic runs for about $5.00 on the Steam Marketplace. An awfully whimsical design for such a brutal weapon! Limited to the Terrorist team, the Sawed-Off is a pump-action shotgun that can continue to be fired while reloading. The reward for killing with a Sawed-Off is rather extraordinary at $900 for Competitive play and $450 for Casual play, but it is not too difficult to use; it inflicts huge damage in close ranges, even more so than ordinary shotguns. At farther distances, however, it is virtually powerless. The Serenity skin design almost seems too pretty to be plastered on a Sawed-Off! It features a beautiful woman surrounded in pearly feathers and mint green hues. All its facets appear delicate, lacy, and it clearly was patterned methodically. This particular weapon, the Sawed-Off | Serenity, can be acquired for only 45 cents! This knife is reminiscent of a particularly stealthy Spiderman. The Huntsman Knife itself is an almost unheard of cosmetic drop. There is a low chance that when opening a Huntsman Weapon Case, the user may randomly receive a Huntsman Knife. The actual function of the Huntsman Knife does not differ from Counter-Strike: Global Offensive’s default knife for players. 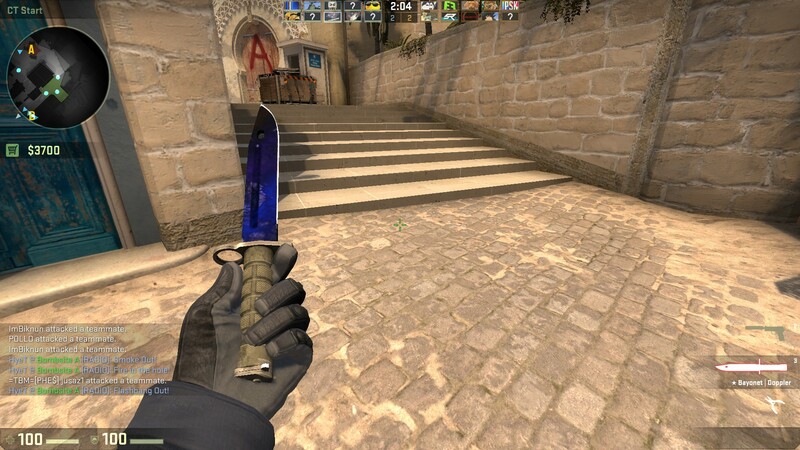 Knives themselves are underappreciated in CS:GO. They are always there and cannot be dropped, and grant increased movement speed whenever equipped. To be killed by a knife is pretty humiliating; as a result, they are worth the most for kill rewards, $1500 in Competitive mode and $750 in casual! Already an exciting drop, adding the Crimson Web skin only makes the Huntsman Knife that much more incredible. Its coloring is vivid, and the webbing detail is intricate. Owning this weapon is an honor. A high cost for a highly desirable weapon – the Huntsman Knife | Crimson Web can be purchased for $400.00 on the Steam Marketplace. Yes, that is four hundred dollars. Finally, a Counter Terrorist exclusive! The M4A4 is the counterpart of the AK-47, both powerful automatic rifles. Highly accurate and fast-paced, it makes for a sold weapon choice. The Poseidon skin is the star of this show; it has an intricate, memorizing design, employing an oceanic theme. The ribbons of teals, navy, and mint are fantastical. There is nothing else quite like it in CS:GO! A beautiful gun, the M4A4 | Poseidon’s cost hovers at more or less $100.00 on the Steam Marketplace. 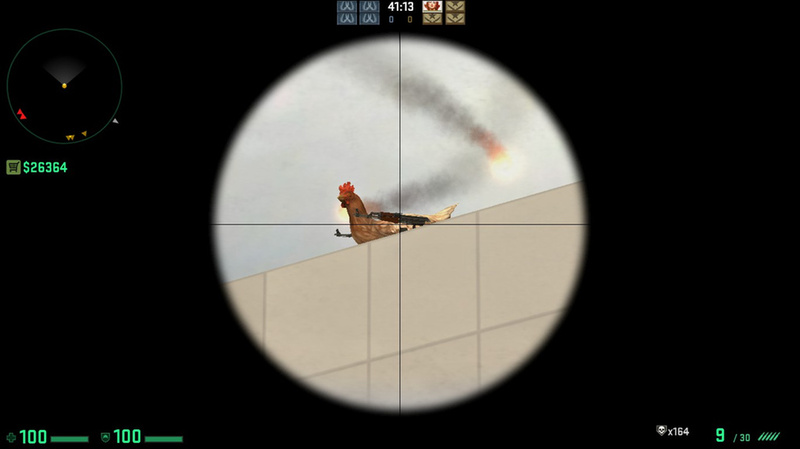 Unfortunately for the chickens, they can be killed for points in CS:GO.